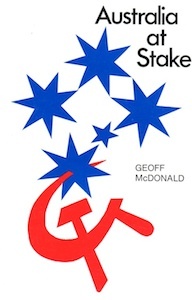 “Australia At Stake” is a fascinating account of political intrigue and manipulation, it also carries a passionate appeal for Australians to debate the nation’s defense situation together with providing a powerful case against Communism by one who has seen it from the inside. Mr. McDonald thirteen years in the Communist Party of Australia comes vividly to life in these pages. It is a story that is both moving and of great concern to all those who feel for Australia’s future. In his often stormy and tumultuous career he has been involved in industrial and political affairs from being an organizer of the Building Workers Industrial Union to freelance industrial advocate who combines a public and industrial relations service to trade unions and professional organizations, he has also successfully represented deep Sea Divers, Mannequin and Models, Nurses and Scientists, and various unions representing tradesman and unskilled workers.